Neil Young said that if you are not getting any new inspiration get a different guitar. 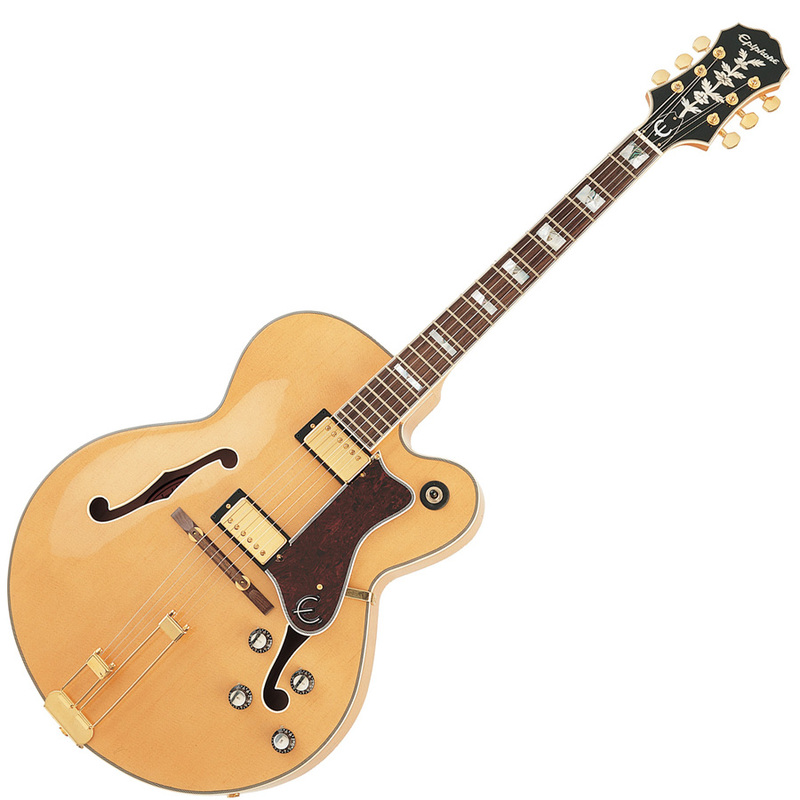 Just a change in neck action, pickups and tone can lead you in new directions, so I was just thinking back on the path that lead me to my current main guitar the Epiphone Broadway, so let’s do a rewind. I was hooked on The Beatles at age five so my Mom bought me what looked like an old Sunburst Gibson acoustic, but must have been a $35 guitar. I couldn’t chord it or anything so I just strummed along to records. That guitar just disappeared after I left San Jose, California when my parents died at the age of six. Growing up, I spun a lot of records, wasn’t much interested in school sports, finally when I was thirteen my Uncle said “you don’t play sports, you should learn to play an instrument since you listen to records all day.” I told him it had to be an electric guitar so he bought me a Lyle SG Copy that was an awful piece of work with pseudo-Gretsch pickups, high action for about $100. I took some lessons and learned to play “Smoke on the Water” on that thing. 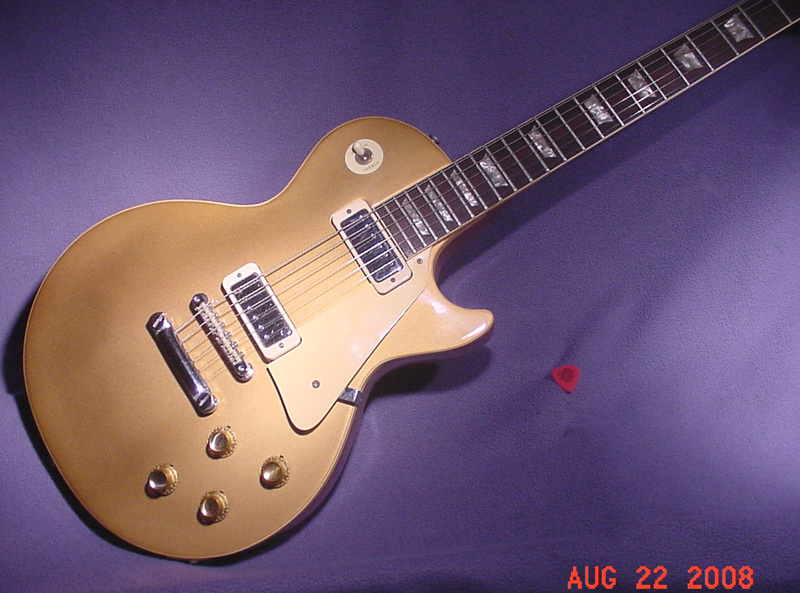 After I had played for about a year and a half I complained enough, saying that I was going to play in a band and needed a guitar that played right, so, my Uncle let me use some of my parents inheritance to get a Gibson Gold top Les Paul Deluxe (it was $150 cheaper than a Les Paul Standard) and a Kustom 4X12 rig. It wasn’t the best, but I figured out how to get distortion by plugging into an old tape machine first. I used it to play my first gig doing covers in Fresno, California with Ambush with Gary Lomprey, Dennis Morrison and Victor Blue on drums. We left California in 1977 when I was getting into punk rock and I started playing Bass for a cover band, Magnum Force with Parrish Hultquist, Dusty Crawford and Jerry Barth, while I was a senior at Cottonwood High School in Salt Lake City, Utah, doing UFO, Queen, Kiss, Nazareth, Joe Walsh whatever. When I turned eighteen, for better or worse, I could tap my inheritance without going through my Aunt and Uncle. I finally got gear that I had dreamt about for six years. I picked up a full Marshall MKII 100 Watt stack in Fawn finish because Guitar City in Kaysville gave me a better deal than the black stack. Back then, there were only 5 or 6 players that had Marshall Amps in the entire state. Okay, now guitars got fun, I bought a Gibson Cream White Explorer in 1978 and had Guitar City fit it with DiMarzio Super Distortion pickups. I used that during my first real recording of one of my original songs, “High Rollin’ Rider” with Equinox with Parrish Hultquist, Jerry Barth and Brian Nolan at Bonneville Studios. 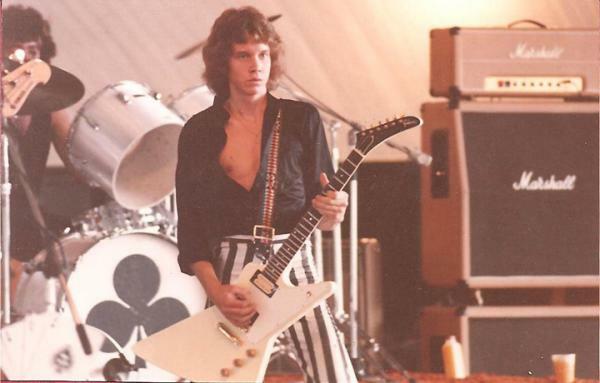 The Gibson Explorer lasted my first year of college before I had to sell it to get some cash in 1979 to Derek Roberts of the band Joker . He still owns it. At least I can get on YouTube and see one of my family guitars. I saw a showcase for a new band called Lois Lane at a Salt Palace Conference Theater in the spring of 1978 and the guitarist was playing a Dean ML. I had never seen anything like it; A combination Flying V and Explorer. I found one, first year Dean ML, Black with cream binding and it was just under $1000. That was a lot of money in 1978. It was more than what I paid for the Les Paul or the Explorer. It became my main rock guitar. I used it when Parrish Hutlquist and I started our band Roxx. I used the Dean ML when I was at Snow College playing in the Jazz band as well as my rock band, Karma with Wally Gerrard, Matt Udall and Doug Johnson. I took it on our Jazz band tour when we went to Chaffey College, Rancho Cucamanga, CA (Thanks Wally) in 1980 to compete against other Colleges. I sold the Dean to Parrish’s girlfriend who gave it to Parrish as a gift, when I went to Venezuela, but not before writing a bunch of Michael Schenker inspired original songs with Karma, like “Doing the Detective Work”, “L.A. Heat” and “On the Beach”. Parrish played it in Moviescreen with Matt Udall, Dana Freebairn and Dave ****before it was stolen. I also got a Gibson white double neck just like Alex Lifeson’s from Brent Brown who had a band called Roadwork when he was leaving for Europe. I paid $1000 for that mid 70’s Gibson. I used it for the Snow College Jazz Band and I also used it when Karma played “Chemical Reaction” and “Wind Song” in order to utilize the twelve string. When The Snow College Jazz band would perform, horn section and all, I would be up there with my Gibson double neck and my Marshall full stack. I would always have a crowd come up afterwards and ask questions in the small town of Ephraim, Utah. I kept the Dean ML (Parrish Hultquist got the DeanML as a gift from his then girlfriend, Kindra who purchased it from me), Gibson Double neck and the Marshall MK II stack until I left for Venezuela for two years in 1982. I needed some cash. If you want to know, I took a big loss. 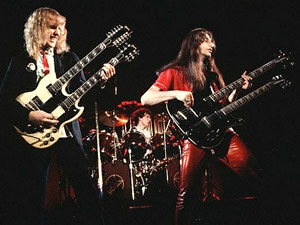 Nowadays, that first year Dean is worth some serious cash, so is the Gibson Double neck. The Marshall was irreplaceable. I have discovered that even the same model Marshalls don’t sound alike and that one had the Mojo. Let’s just call this phase one. 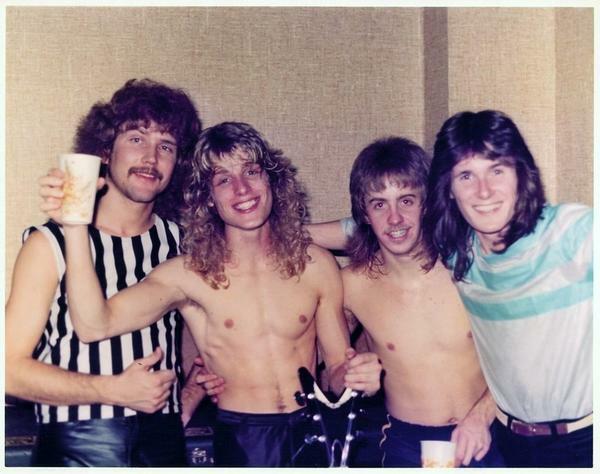 okay – too weird – we were talking about Roadwork – Brent Brown and how I knew a kid at Snow College who had the only band on campus that knew Brent Brown – so we googled it – and this popped up. Karma a “cannibal production” – wasn’t that the intramural team name. I remember the concert with Jimmy Gobel’s band from Gunnison as the warm up and your lead singer sceaming incoherent lyrics. 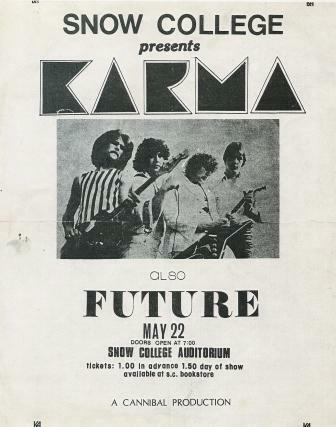 30 years ago – but it was the only show on campus that year. I think you’re the dude – I played bass in the chamber orchestra. Anyway too bad about having to sell everything to go on a mission – I had to sell my Blue VW Beetle – killed me – but I bet that there are stories of deals all over the State of Utah about guys selling things just before they leave. Glad to see you’re still in the music business. KARMA a cannibal production – I’ll laugh all day now..
Wow, small world. I still keep in touch with Brent Brown. Wally Gerrard , the lead singer is now involved in the acoustic scene in Tucson, Arizona. Matt Udall, who played Bass is an actor has bene in a few cable channel historical figure pieces, beer commercials, and scary films, he is also an Attorney in Sacramento and still plays Bass. I have a pic of him on my “about” page. Me and my roomates were nicknamed the “Cannibals” at Snow College. We named the intramural team after our nickname and anything we did as “A Cannibal Production”. We had radio spots for that show and I remember the DJ saying ” A cannibal produciton, gonna eat em up”, whil “Cat Scratch Fever” was playing. I was just happy to play songs I had wrote back then. Time marches on. I remember Future. After that show they bought the same gear I had. We were pretty obnoxious. I’m about ready to write another segment. Hey…I remember you! its Gary! I remember when you got the Gold top Gibson. I was so envious! I hope you are still playing. I remember your name being “***” from Ahwahnee Junior HIgh. You are legend in my book! I really looked up to you and Dennis Morrison back then. You were the Jazz master with a musical lineage and Dennis could play Hendrix and his Mom wrote Buck Ownens / Beatles “Act Naturally”. Thanks for sharing memories, hope all is well. Ambush was but a moment, but, thanks for the time and the effort.